(It's as if it's new, it wasn't ever used, it sat on a bookshelf next to an old CRT monitor, it also has every part). on it. I tried googling it, but literally nothing useful came up, only pictures from shared folders. No one is writing about it, no one is asking about it on forums, heck, no one even sells one on e-bay or other online markets. The most useful link was from a newspaper archive with a newspaper from '82 mentioning this. What's this machine and from when? How much is it worth? The IBM5291 is one of the IBM5250 series of terminals. 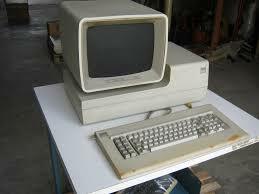 It provides a user interface to an IBM minicomputer. The interface will be by Synchronous Data Link Control (SDLC). The hardware being paired co-ax wire system. This enabled a number of these terminals to be daisy chained to a single port on the host minicomputer. There are a number of modern emulators around for these terminals, so that you can use, for example, a Windows PC to communicate with your old IBM mini. However, they use virtual network connections as opposed to physical wired connections. Going the other way - using your terminal to communicate with a modern computer - would require a hardware adapter. There is a manual for the 5291 available online here that you may find useful. It includes the keyboard pinouts, so you can set yourself a challege to repurpose the keyboard for something else. What is it worth? Depends if you can find someone with an AS/400 (or similar) who wants an SDLC compatible terminal for historical reasons. 5250 is a block mode display system. The server sends out a blob of data to the terminal, which then by itself formats text in color in a pretty way at 80 columns by 25 lines. The server also tells the terminal to create areas where the user can type things, typically displayed as an underlined area, and/or a list of function keys the user can press to send commands back to the server. The user's terminal is pretty smart by itself, and handles all cursor movement and text entry without constant per-character hand-holding from the server as with a normal unix terminal session. When you send data back to the server, it only sends back what is inside the editable areas. The terminal protocol is designed to be as efficient as possible so that the server is freed up for actual work, so common commands are assigned to single-press function keys, and the function numbering goes up to F24, so there can be a huge number of them available at any time. You can insert and delete characters in the editable text fields but you can't go over the limit of the field length. Because the display of data is so tightly locked down to the 80x25 display area, it is common for commands and names of things to be "smushed" into some very short abbreviation to fit in the limited space available in each column of data. EDIT: An interesting side effect of 5250 and 3270 block mode terminal protocols is that they have a very similar modern equivalent... web pages with data entry fields. It is possible to run a web server on an AS/400 that reformats 5250 / 3270 block mode directly into a web page, and reassigns function keys to clickable buttons on the page. With this, terminal hardware or a terminal program is no longer needed, but instead only a web browser. Not the answer you're looking for? Browse other questions tagged ibm collectability or ask your own question.